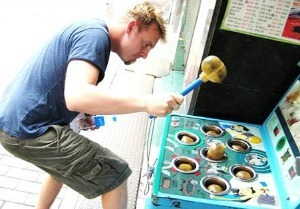 Whack-a-mole is an arcade game in which toy moles pop up at random from holes in a board. The object of the game is to hit the mole with a mallet when it pops up. You keep score by how many moles you hit and how fast. The term has come to mean a repetitious and futile task: whenever an adversary is “whacked,”it pops up again somewhere else. It’s a metaphor for Mississippi River floods and efforts by the Levee Board and the Corps of Engineers to whack the levee breaches, sand boils, back water floods, and so on that keep popping up. The Corps keeps score by how many people it doesn’t flood. It may not count those it does. But parts of Mississippi are still flooded because the water can’t get to the Gulf. The Commissioner’s levees have protected some areas but have made flooding worse in others. Recent local rains have caused flooding behind his levees though. The water is trapped. It needs to get to the Gulf too so Mississippi can dry out. The solution is to get all the water to the Gulf faster. How? Where? The best hope for Mississippi is to send more flow down the Atchafalaya River via the Old River Control Complex. This complex is just south of Fort Adams, MS, where the swimming deer in my article were photographed. The county road there has been under water for four months. It was thirteen feet deep when the river crested. (I know because I have property there.) The Commissioner may not be concerned about flooding on this 135 miles of the river south of Vicksburg since there are no levees to maintain. This stretch of the river is bound by natural bluffs. The land between the river and the bluffs floods well below flood stage. Its landowners watch the Natchez gage closely. Every foot of rise matters. Not political. The Commissioner said I’m wrong about the decision not to open the Morganza Spillway. It’s a Corps project north of Baton Rouge that discharges river water to the Gulf via a floodway east of Morgan City. It reduces crests at Baton Rouge and New Orleans (and in Mississippi). He said the decision was not political. Besides it wouldn’t have helped the Delta much anyway. He said opening the Morganza would have lowered crests upstream to Natchez (not his concern) but not much at Vicksburg and the Delta (his concern). He didn’t mention that the increased discharge would have shortened the duration of the crest when the risk of levee failures is highest. His levees had some close calls, but luckily no failures. Otherwise the discussion now might be about what should have been done. Who gets flooded. Louisiana papers, TV, and internet sources reported frequent meetings between Corps officials and politicians in December and January. They were about opening the Morganza and the Bonnet Carré at New Orleans. Politicians included the outgoing and incoming governors, mayors of cities that would be flooded or not flooded depending on the decision, state legislators representing their constituents, and so on. The meetings were about flooding in Louisiana. Mississippi was not their concern – nor apparently the Commissioner’s. The decision. The Commissioner said the spillway decision was based strictly on engineering flow calculations. The Corps commander just checked the numbers and executed the plan – and ignored the concerned governors, congressmen, and senators. Generals do that, don’t they? And generals don’t deviate from plans depending on field conditions either, do they? And plans with numbers that favor one state over another aren’t political either, are they? The Corps is part of the US Army which produces after action reports on major engagements. It will probably produce one on the 2016 flood and the decision not to open the spillway. There is already one about the greater flood of 2011. The title is “Divine Providence: The 2011 Flood in the Mississippi River and Tributaries Project.” It’s 330 pages. There’s a lot in it about the decision to open the Morganza . It doesn’t read like the general just checked the numbers. It reports that the general considered three scenarios to relieve the flood at Baton Rouge and New Orleans. He conferred with many people. He delayed the decision until the river almost overtopped the Morganza (which would have prevented its being opened). One scenario was to discharge more flow at the Old River Control Complex. But it was too late to use it to moderate the 2011 flood. The water there was already too high to open more spillways. Open it early. When a flood is coming, why wait to open more spillways there? Why not whack the mole before it pops up? It will help Louisiana and Mississippi too. Why not put that in the plan to moderate the next flood? Open it now. Why wait for the next flood? Why not send more flow down it now to relieve the current flood in Mississippi?